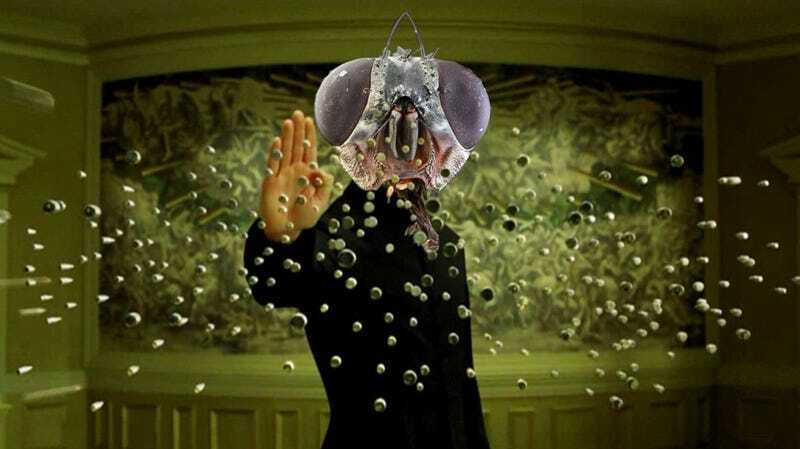 If you've ever sat puzzling over a fly's ability to outmaneuver your swift slap of death almost every. single. time—puzzle no more. According to science, you're just measly Agent Smith to the bug's Neo; new research shows that a creature's perception of time is directly related to its size, meaning flies live in a world where time passes as if in slow motion. Interestingly, there's a large difference between big and small species. Animals smaller than us see the world in slo-mo. It seems to be almost a fact of life. Our focus was on vertebrates, but if you look at flies, they can perceive light flickering up to four times faster than we can. You can imagine a fly literally seeing everything in slow motion. It's tempting to think that for children time moves more slowly than it does for grownups, and there is some evidence that it might. People have shown in humans that flicker fusion frequency is related to a person's subjective perception of time, and it changes with age. It's certainly faster in children. And just as that might suggest, the study supports the notion that the various perceptions of time in different animals is directly linked to the "difference between life and death." Not only in terms of aging but also how certain animals manage to avoid predators. For instance, fireflies use flashing lights as signals that larger animals might not even be able to see due to their quicker perception of time—like a secret code for the perennially quick.